3 x C+ Risers, 40"
3 x Grip Heads, 2.5"
Matthews has put together this Trio C+ Traveler Kit for image-makers who need to take a heavy-duty support system on the road. 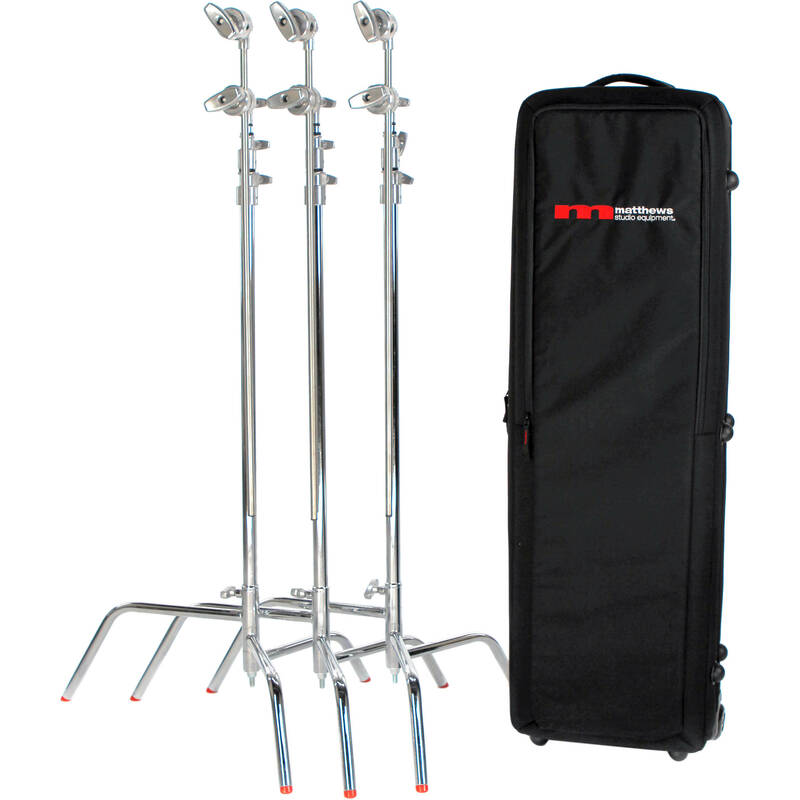 The kit includes three 10.5' C-stands, each with a removable Turtle Base, a 40" riser, a 2.5" grip head, and a 40" gobo arm. The wheeled kit case is included to store all the components. Transporting up to three select, removable base C-stands with arms and related accessories is a simple chore with the black C-Stand Rolling KitBag from Matthews. The main compartment features a bright red, high-visibility lining, a divider to keep gear from bumping, and touch-fastening fabric straps to prevent movement. ABS honeycomb and high-density, closed cell EVA foam padding provide impact protection. And the water-resistant, 900D polyester and ballistic nylon exterior ensures both strength and durability. Photographers will appreciate the business card holder, wheels, rubber feet for upright standing, top and bottom haul handles, and side carry handle. This Matthews Century C+ Stand with Turtle Base and Grip Arm Kit consists of a 40" three-section upright with two risers. It includes a removable turtle base, a 2.5" swivel grip head, and a 40" Hollywood Arm that can hold a small light fixture, gobo, or flag. The unique staggered leg design of the C-Stand allows it to be nested and placed extremely close to one another on a set. Hollywood Gobo Arm - 40"
Hollywood Grip Head - 2-1/2"
Box Dimensions (LxWxH) 54.0 x 17.5 x 10.5"
Box Dimensions (LxWxH) 55.0 x 22.0 x 3.7"